The perfect puzzle game for all those who want to have fun! In this clever game, the detectives must find, as quickly as possible, a word-riddle (character, film, city ...) from funny clues provided by the players (drawings, mimes, color, melody, sound effects ...)! Will you have more flair than other detectives? Connect the clues and make the right deductions to win the title! 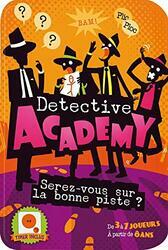 Who will be the star of the Detective Academy?